All tire pressures (including the spare) should be checked monthly when the tires are cold. “Cold Tires” means the vehicle has not been driven for at least three hours or driven less than one mile (1.2 km). Recommended pressures must be maintained for optimum vehicle handling, and minimum tire wear. All specifications (sizes and pressures) can be found on a label attached to the front driver side door. The correct tire pressure is 30 psi (210 kPa). The compact spare should be maintained at 60 psi (420 kPa). Over inflation or under inflation can reduce tire life, adversely affect vehicle handling, and lead to sudden tire failure. You could lose control and have a serious accident. Follow all the guidelines about proper tire maintenance. Warm tires normally exceed recommended cold tire pressures by 4 to 6 psi (28 to 41 kPa). 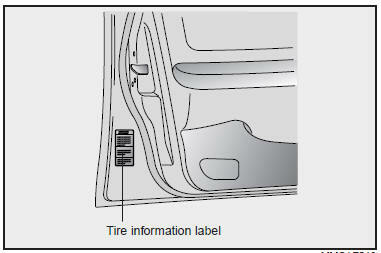 Do not release air from warm tires to adjust the pressure. The tires will be underinflated. Underinflation results in excessive wear, poor handling, reduced fuel economy, and possibility of blowouts from overheated tires. Also, low tire pressure can cause poor seating of the tire bead. If the tire pressure is excessively low, wheel deformation and/or tire separation is possible. So keep you tire pressures at the proper levels. If a tire frequently needs refilling, have it checked by an authorized Kia dealer or a competent tire shop. Overinflation produces a harsh ride, handling problems, excessive wear at the center of the tire tread, and a greater possibility of damage from road hazards.